Looking snazzy in that frame! Look at all those curves. Lots of practice! Remember waaaaay back last winter when I took 3 months off to go to California? And remember how I made my first “artier” mosaic while I was there? OK, confession time: that piece has sat — still all wrapped up from its journey back to Canada — under my work table since we returned in June. I know, you guys, I know. All I had to do was unwrap the thing and take it to the framer’s (which is only like a kilometre away), but somehow it just never got done. Until a few weeks ago, that is. Yes, I made R take a picture of me looking all excited. I am a geek. Now, I could already see it fairly well through its wrapping, but when he gently cut away the bubble wrap and revealed the framed mosaic, it was like Christmas morning. But not adult Christmas morning; more like Christmas morning when you’re 5 years old. I was over-the-moon giddy and grinning ear to ear. That night I kept periodically walking over to my work table to look at it, or randomly breaking out into a smile just thinking about it. It’s weird. I mean, I was thrilled when I finished the piece and got it all cleaned up. But seeing it framed just took the happiness and excitement to a whole other level. There’s just something really cool about seeing your work framed and looking so, for lack of a better word, ‘professional’. I don’t know if it was so exciting because this was the first mosaic that I’ve had framed, but I’m not-so-secretly hoping that it will be this satisfying each and every time. I don’t want this thrill to wear off! P.S. Big shout-out to Patrick Gordon Framing. They do excellent work and I would totally recommend them to anyone! Today’s job: stick it to the Wedi board with thinset and then remove the craft paper. Can’t wait to polish it up after I return from Oakland! Making good progress on the background. Not looking forward to filling in all the little finicky spaces. I really miss my hammer and hardie! Finally got all the coloured bits done. YAY! Now on to the background, which will be marble. Haven’t made as much progress as I would’ve liked, but that’s because I’ve been busy prepping for our trip to Costa Rica and Guatemala. Which reminds me: No WIP Wednesday next week, since I’ll be exploring the Costa Rican cloud forest! Getting there, slowly but surely. You can’t see it from the back, but there will be 2 shades of pink. Just need to finish the last of the light pink and then I can start filling in the background, which will be marble. Four colours down, three to go…and then the background. Oh, by the way, what you see here is the back of the piece. The front remains a mystery! 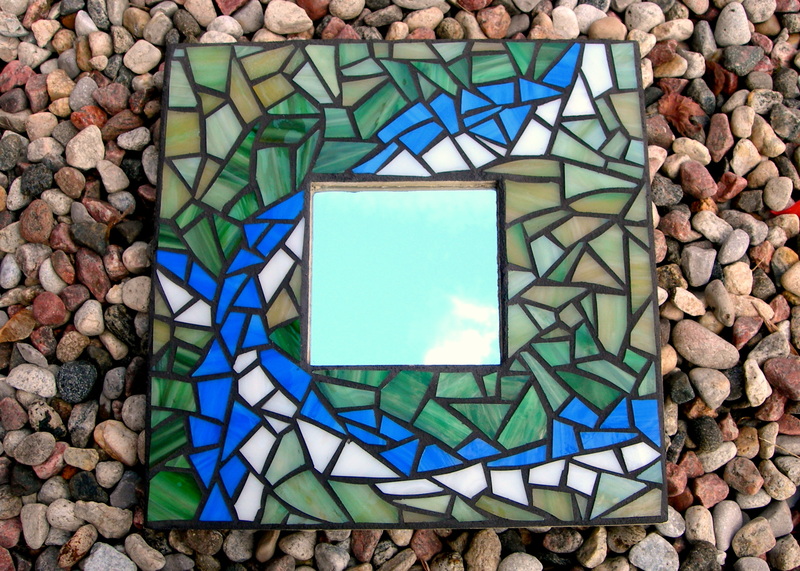 When I made this mirror, I kind of pictured a river or something in my head. But when I showed the finished piece to my partner, the first thing she said was that it reminded her of the colours on the Guatemalan flag. Funny how people can see such wildly different things in such a simple design, eh?